Ever since reading about dried bean curd skin on Vegan Ronin, I’ve been on the hunt. I had the hunch that Green Sprout’s amazing amazing amazing “chicken” dishes were made using bean curd skin and I’m fairly certain after sampling my own that I was correct. The texture of the rehydrated bean curd skin is amazing–just like chicken! (Well, or at least what I remember chicken being like…) The twists are made of layers and layers of skin twisted into a knot, so each knot has this amazing dense, stringy, chewable texture. You want to make sure that you get the twists completely soaked, though, to get that perfect texture. It’s like rehydrating mushrooms or soy curls–you just gotta wait. 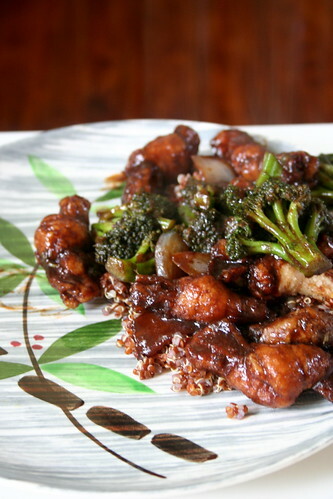 These are definitely much more wonderful than soy curls–more to chew on, although probably not good on pizza–and much much cheaper–only $2 a bag or something at Super H. Paired with blanched and stir-fried broccoli in a black bean sauce, the chickeny twists were perfect. The recipe makes about 6 servings and I ate most of those in three or four sittings. Mmm perfect late night after drinking snack/meal! Reyhydrate the bean curd skin twists by placing them in a bowl with the hot water or broth for 20 minutes. Make sure that the twists are completely saturated and not hard in the middle. Blanch the broccoli in a pot of boiling water for 1-2 minutes or until the broccoli is just tender. Immediately drain the boiling water and run the broccoli under cold water to stop the cooking process. (Be careful not to overcook the broccoli!!!) Set aside. Mix together all of the sauce ingredients in a saucepan over medium heat. Whisk for 3-5 minutes, until the sauce thickens. Let simmer until needed. In a wok on medium-high heat, heat the oil until hot. Add the onion and cook for 3 minutes. Add the garlic. Cook for another 30 seconds, or until the garlic becomes aromatic. Add the broccoli and the beancurds, then add the sauce and stir-fry everything for 1 more minute. Make sure the sauce covers everything. Serve over your favorite grain! I wish I could find stuff like that here! I’m sure it would be good with regular fried tofu or tvp too. fermented black beans are one of those foodstuffs that make my mouth water. I am going to try this today. If this tastes like Green Sprout I am going to find and kiss you. You may be a god. That looks awesome, just like something you’d get from a Chinese restaurant. I’ve never seen bean curd twists before, but I will be on the lookout. It’s strange stuff, that bean curd skin. We’ve gotten it dry, and don’t like it so much as compared to making it for ourselves. It’s so much more tender that way. I don’t think it’d stand up to this recipe, though – this sounds a bit … strong, for the subtle, silky, homemade stuff. ohhhh..looks amazing! I must try that soon now that I’m back on a major tofu kick again! That’s awesome, thanks for sharing the recipe. I’ll go and grab a package of dried yuba twists at my local Asian foodstore! oooooh – i totally need to find me some dried bean curd skins! mmmmmmm! i was a bit disappointed with soy curls, but i think i’d really love the curd skins! thanks, Jes! and your dish looks most glorious! huzzah! wow, i have never seen or had these (i don’t think). looks really really tasty though! i’ve never heard of bean curd skins before. I keep meaning to make a trip to a big asian supermarket – I’m sure they’d have them there!! Oh, great find- I wish I could get the same here, too. Sounds like a fantastic dish! I keep overlooking those soy-knots! I use the sticks all the time in miso soup, I wonder why I haven’t tried this version yet? That plus black bean sauce… this looks super delicious and I think I have to try it! This dish sounds really good. I tried those twists a couple of times and just couldn’t get the knot soft. I guess I was just too impatient. Hey Jes, hope you’re still monitoring this post- what size was your package of twists? I have 10.5 ounce packages from a local Asian-Mexican market, and I’m thinking this amount would be plenty for at least six servings, but after being re-hydrated could also be too much. You know, I’m not sure how big my package was, but I think it was somewhere in the 8-10 oz category. I remember this making quite a lot after adding vegetables, so I think that would be the right size for 6 people without having too many leftovers. Sorry I can’t be more helpful!